This resource features the general description of a planar observatory near an Ardennian mountaintop. 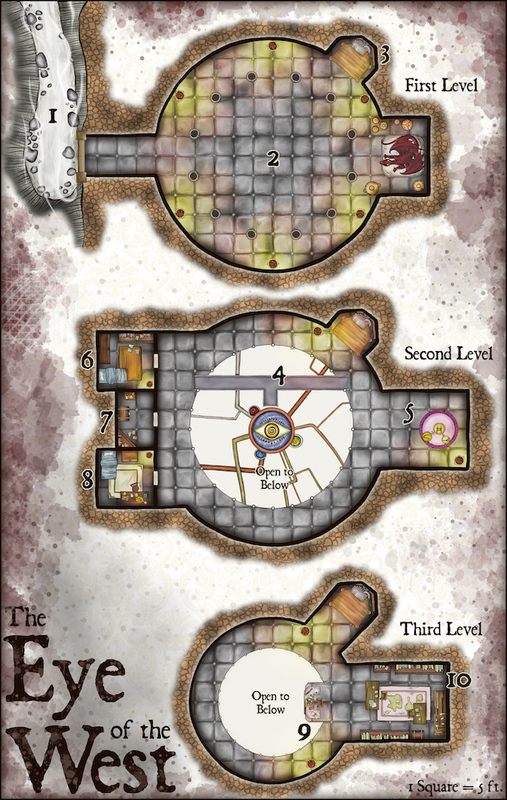 It includes adventure ideas that are appropriate for mid-level (Levels 6 to 10) adventur­ing parties. Challenge Rating (CR) is calculated using a party of four as the model. There is a planar observatory in Ardennia. It is located in the mountain range in the middle of the kingdom’s territory. It is close to the capital but due to the difficult journey up the mountain, it takes at least two days to reach the complex. Few travel there for good reasons. To begin, the place is so far up the mountain that the cold is unbearable to most travelers. And second, there are plenty of tales of a merciless guardian inside the observatory. Some tales end with the travelers being turned down who return home empty-handed, other tales end with the travelers being destroyed by the guardian. All of those tales are true. There is a guardian, and it is a dragon. Some say it is made of stone, others say it has red scales. Others say both things! Regardless of the actual truth, no one travels there. However, a promise of power and knowledge remains. All this because it is said that the observatory in the mountain is capable of seeing any location within this world and even other worlds beyond the stars. A narrow goat trail is the only path to the Eye of the West. It starts at the base of the mountain range, a few hours north of Ardennia and leads all the way up to the observatory’s doors. From the midpoint forward, any traveler suffers the effects of extreme cold climates. Traveling without protection for such weather means death for most people. The observatory doors are made of a strange adamantine alloy. They are heavy but unlocked. The chamber features six magical braziers and twelve pillars all around the room. If a character looks up, a portion of the internal clockwork machinery of the eye device is visible above. Scores of pipes and cables connect the eye to other machines and apparatus on the walls. The Eye of the West is the home of Vaathrifax, a young red dragon who is the guardian of the observatory. Vaathrifax is actually dead. He offered the essence of his immortal spirit to the creators of the observatory eons ago. Vaathrifax now lives inside a life-like statue of himself in the eastern alcove of Area 2. When visitors arrive, Vaathrifax uses the magic in the statue to transform the rock to flesh and become a living form once more. He explains that the observatory can only be used by powerful beings and that anyone unable to beat him should return home empty-handed. When defeated, the dragon turns back to stone and breaks into hundreds of small pieces. The pieces reform after 1d6 hours and Vaathrifax’s statue continues its vigilance. After a particular person or group defeats Vaathrifax, he does not confront them again. A wooden winch elevator connects the three levels. The means for activating and controlling the elevator are in a metal panel in the platform. A successful DC 10 Intelligence (Arcana) check reveals the proper way to use the device. The middle part of the second level is hollowed out to house the eye device. This is the actual observatory. The eye-shaped panel on its top projects tridimensional images that can be observed from Area 9. The device requires constant adjustment as the stars change positions and the planes to be observed move around the multiverse. A stone bridge crosses the hollow part of the second level and lets a tinkerer make adjustments directly to the eye device. If a character wishes to make an adjustment for a different plane, a successful DC 17 Intelligence (Arcana) check allows a character to make the appropriate changes. A circle of runes on the floor provides the means for teleporting directly to the Eye of the West. Any spellcasting character can copy the runes of the circle to a spellbook in one hour. Yugannate, the caretaker and only living creature in the observatory, meets any visitors here. He is an arcanaloth. He spends most of his time in the study room creating new adjustment variables for the eye device and observing faraway planes on Area 9. Yugannate can help the party use the observatory for their own means. He has a strange aloof personality but actually appreciates the company. If Yugannate catches any member of the party damaging any component of the observatory or if they attack him, he can conjure the power of the whole device and forcefully teleport any visitors to a faraway plane. This room is furnished for visitors. No one is occupying it currently. The bookcase inside has poetry works from authors all over the multiverse. They are in many languages unknown to the party. The collection itself is valuable, the right buyer may up to 1500 gold pieces for it. Yugannate disapproves this action and teleports away the thief. This room contains many discarded trinkets that did not fit anywhere else. The chest contains old clothes and a wand of magic missile. Hidden in the bookcase is a book that describes a few advanced functions of the eye device. A character that reads it and succeeds on a DC 18 Intelligence (Arcana) check knows how to use the eye device to create a forceful teleportation effect twice per day. This ability can only be used inside the observatory and can target any creature or group of them and send them to any plane the eye is currently tracking. Yugannate sleeps in this room. It is not locked but he alerts any visitors that the room is off bounds. There are many magic scrolls in the room and Yugannate’s spellbook which contains all archmage spells. If the arcanaloth discovers anyone inside his chamber he forcefully teleports them away. Once the eye is adjusted in the second level to track a particular plane, the control panel in Area 9 can be used to move the observation device to any location within the plane. Using the device is no easy task. A successful DC 20 Intelligence (Arcana) check allows a character to correctly focus the observatory to the desired location. Failure simply means that the observatory is looking at a different location. If a character studies the books about the control deck in Area 10, he or she rolls with advantage. Once a location is chosen and the observatory is activated, the device in the second level projects images for all to see in Area 9. This scrying device does not supersede anti-scrying spells or magical auras so any location with such protections appears as a dark cube in the projection. A gigantic assortment of books and scrolls are available in this library. Most of the books are about the functioning and maintenance of the Eye of the West. Others are journals of past visitors and users of the observatory. Other books are outsider’s explanations, tales, and theories of what the place is supposed to be. A character can study here to better understand the device. Learning to use the control panel takes two weeks of studying and trial and error. Learning how to make adjustments to track different planes in the machinery in the second level takes two weeks too. On the other hand, learning what is necessary to give maintenance or fix the device if it malfunctions will take any character six to eight months to do it properly. 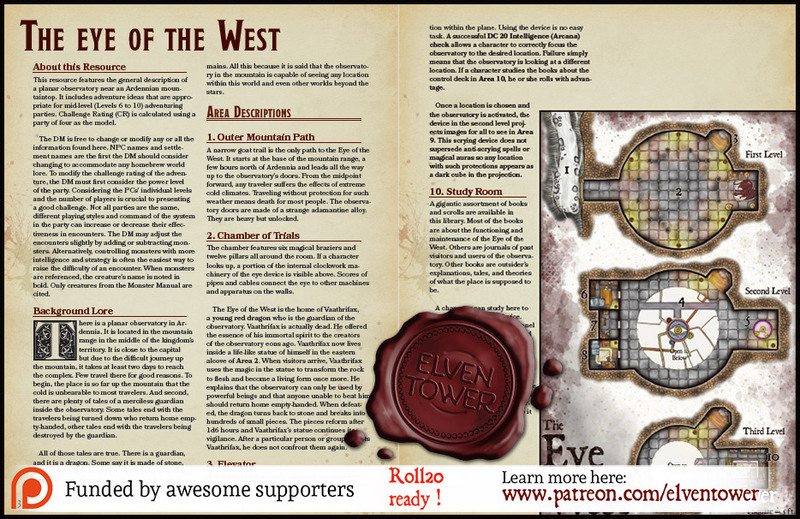 These are the general features of the Eye of the West. It is a three-story complex near a mountaintop. It is located two days of travel away from the capital, Ardennia. Weather. The observatory is so high that the immediate area around the place is in a state of permafrost. Characters without clothes and equipment appropriate for cold weather suffer the consequences of extreme cold conditions. Terrain. The interior of the Eye of the West is well kept by invisible servitors. The marble floor tiles are in good shape. Doors. The outer doors are made of a rare adamantine alloy. Despite that, they are never locked. The slide inwards when enough pressure is used. The doors to the chambers in the second level are made of hardwood and feature no locking systems. Light. There are magical braziers in most chambers. They produce bright light and never go out. A dispel magic or similar spell suppresses the light of a single source for 3 (1d6) hours. Smells and Sounds. The eye-shaped device in the second level has thousands of cogs and other small mechanical parts inside. They produce a never-ending droning or humming noise that changes in pitch and volume continuously.